Learn about the spectacular islands which lie just off of Ventura’s coast at this visitor center which also features a tide pool, museum, lectures and helpful park volunteers! 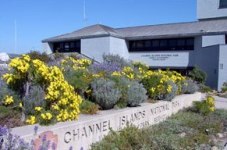 Headquarters for the Channel Islands National Park and Marine Sanctuary, the Channel Islands National Park Visitor Center is a one-stop resource for information on the five northern Channel Islands. Begin near the entrance, where contour models provide perspective on the relative size, shape and positions of the windswept islands offshore. Step inside to see a full-sized display on an elephant seals, and island fox and a replica of a pygmy mammoth skeleton found on Santa Rosa Island in 1992. Kids will want to peer inside the living tide pool, home to sea urchins, sea stars, lobsters and an elusive swell shark. Rangers and volunteers are happy to provide information about the natural and cultural resources on the islands or to direct you to boat tours, plane flights, and camping sites.